As start getting ready for Thanksgiving, I thought you should have an easy app under your belt so your guests can stave off the munchies while waiting for the big feast. When talking about Bruschetta, let’s first get the pronunciation down… it’s not brushhhhh-etta, it’s broo-sketta. It’s more fun to say the authentic way! Secondly, it’s all about the bread! 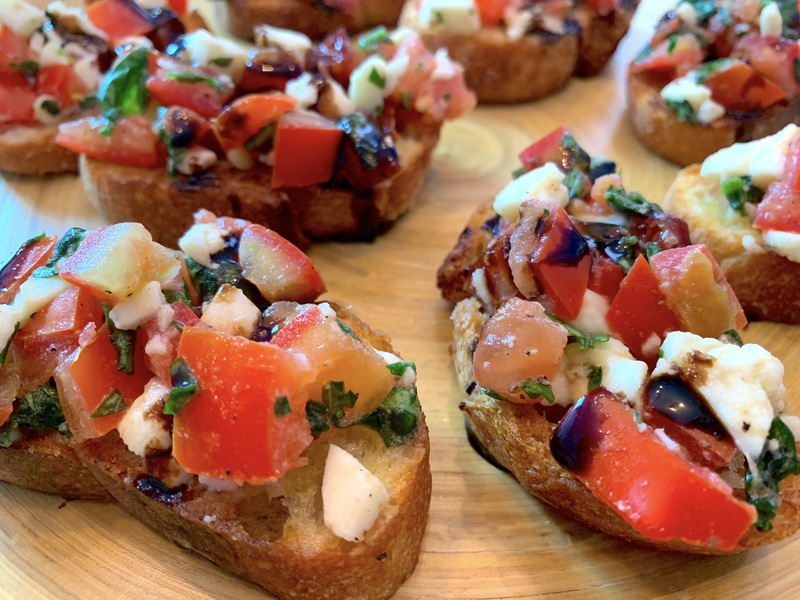 Bruschetta, by definition, is an antipasto/appetizer from Italy consisting of grilled bread rubbed with garlic and olive oil, then topped with your choice of tomato, vegetables, beans, cured meat, cheese, etc. And what that says to me is DELICIOUS OPTIONS!!! One of my favorite ways to enjoy bruschetta, and likely the one you’re most familiar with, is with some version of tomatoes. My favorite is a mix of plum tomatoes, fresh fragrant basil, garlic, and fresh mozzarella. As you can see, it’s really simple to prepare and although I am giving you the recipe, it’s really more of a suggestion. You can create whatever delicious mix that tickles your taste buds! Of course, I say… make mine! Haaaaaa! I love a finishing it with balsamic glaze, which gives it an extra touch of sweet. You don’t have to buy it… it’s easy to make and stays for a good long time in the fridge! I’ve given you that in the notes. 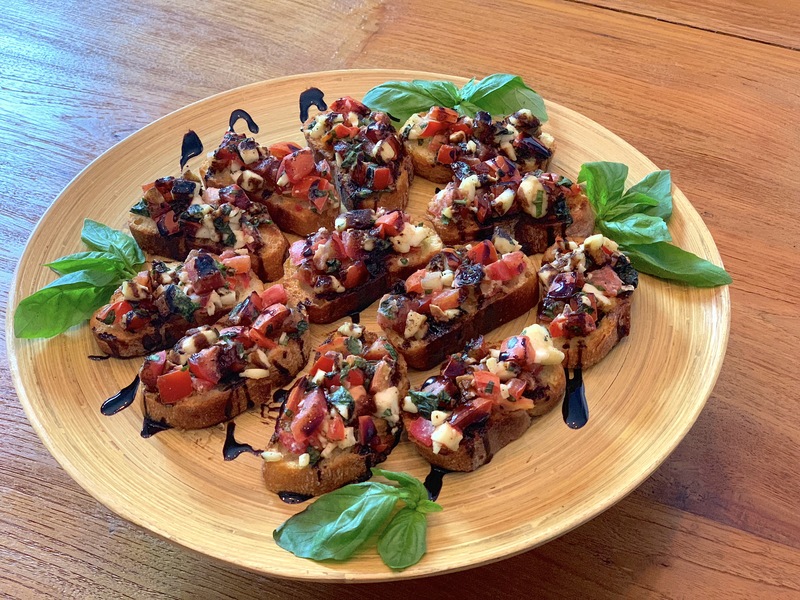 The crunch of the bread… the brightness of the tomatoes… the crisp perfume-y flavor of the basil… the richness of the mozz… the tang of garlic… and the sweet finish of the balsamic glaze… WOW! Dig in! 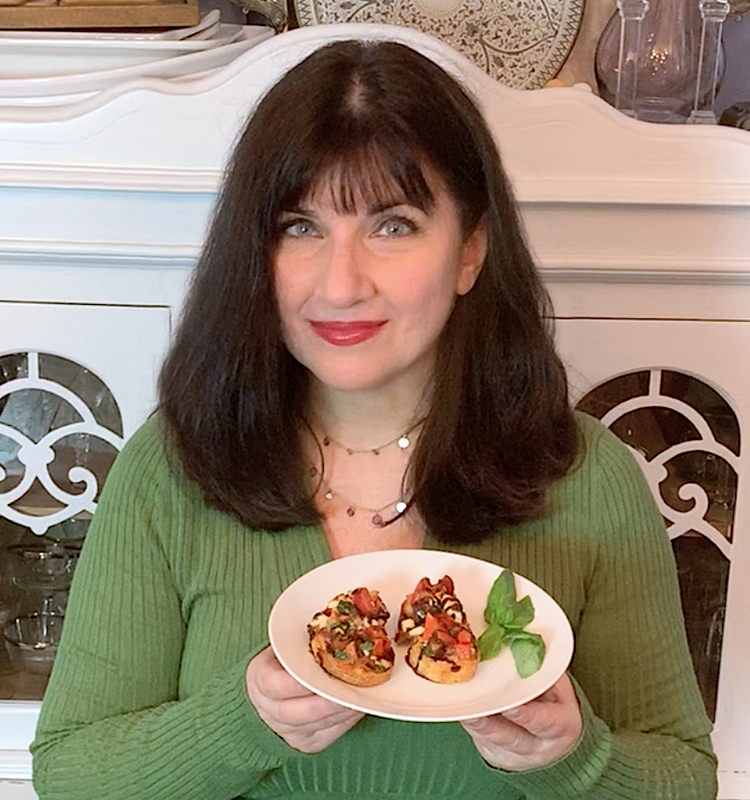 Bruschetta with Tomato, Basil, & Mozzarella! In a large bowl, mix minced garlic, tomatoes, basil, and mozzarella with salt & pepper. Set aside. Brush each slice of bread with olive oil and toast. Rub with whole garlic cloves and plate. Spoon tomato mixture onto bread, drizzle with balsamic glaze, and serve. To make balsamic glaze, add a cup of balsamic vinegar and 1/4 cup of honey (or maple syrup) to a saucepan and bring to a boil. Lower heat to medium-low and simmer until it reduces by half, which will take about 10 minutes. It will become a syrupy consistency. Let cool and enjoy. « Welcome Pumpkin Season! Pumpkin Waffles!